Over many years researchers have tried to find ways to cure dementia, but they have not succeeded.. yet. In this project we applied a new approach, to care by using new technologies to improve the quality of life of people with dementia. 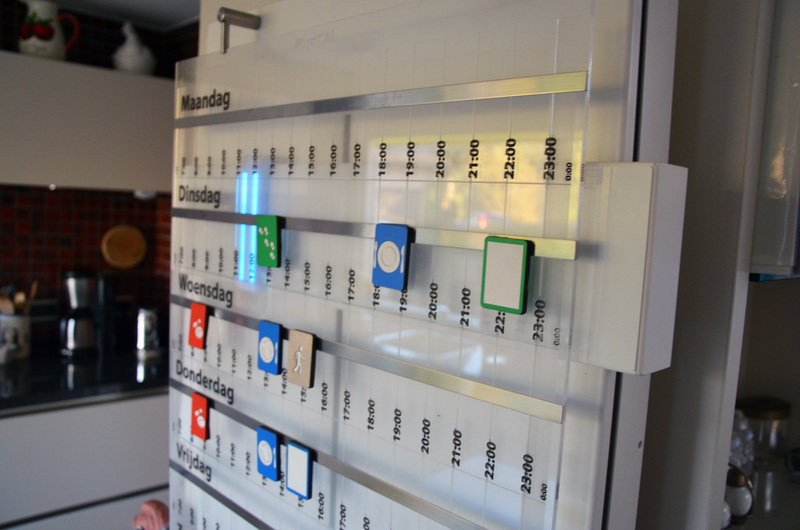 The design of the PhysiCAL, a tangible planning calendar, provides a solution to deal with day-to-day time and activity management in at home. The design is kept physical to make it usable by and understandable for people with dementia. The calendar provides an overview of an entire week of events. A time indicator moves across the week (horizontally) to indicate the current time. Magnetic event tags can be put on the week schedule to create events. When the time indicator passes such an event tag, a light is shown and sound plays to attract attention. If desired, messages can be attached to the event tags to add to the information of the tag and increase trust in the event. For the early phase of dementia, this will empower the person to create personal reminders and act independent. Along the process of dementia, the calendar becomes a tool for the informal care giver to manage the home environment in a simple way. If introduced early, the calendar will remain a reliable reference for the person with dementia for a long time in the dementia disease process.